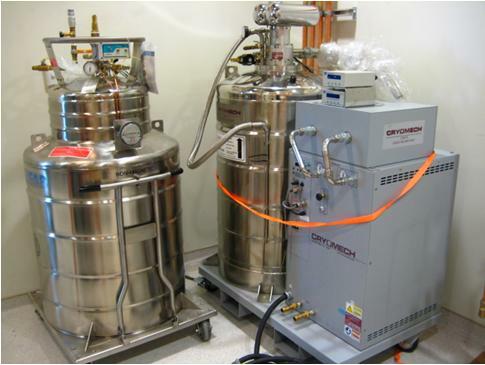 The Canadian Center for Behavioural Neuroscience (CCBN) houses a helium recovery system that is used on the 500 MHz NMR Magnet and both of the MRI magnets. This system collects the boil off gas from the magnets and stores it in an 8000 liter storage tank. This gas collection system works using the Q09.4-HR3 Helium Gas recovery compressor system from Quantum Technology Corp. The gas is then re-liquified using a Cryomech LHeP18 liquid helium plant capable of liquifying 18 liters of liquid helium per day. Our system is also outfitted with a 250 liter holding dewar for carrying out the magnet fills. The University of Lethbridge Pronghorns represent our campus in interuniversity sport. Go Horns!